Photograph, black and white, Priest Pot, Claife, and Hawkshead, Lancashire, by Herbert Bell, photographer, Ambleside, Westmorland, 1890s. 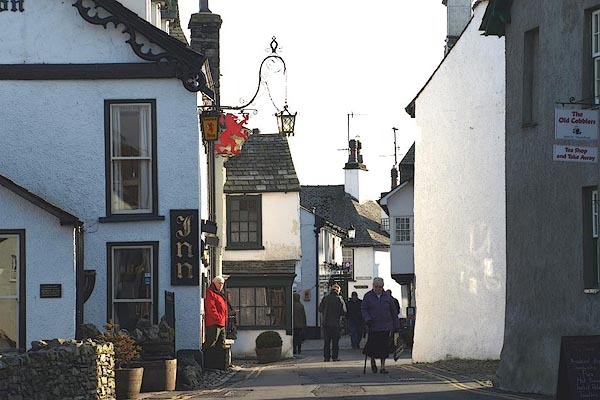 HAWKSHEAD is a neat small market-town, standing in a warm and sheltered valley, surrounded by the lofty fells of Furness, and is doubtless of great antiquity, although there is no authentic record of its origin. The Free Grammar School has been the nursing mother of many eminent scholars. The beautiful and pastoral lake, Esthwaite Water, may very conveniently be perambulated from this place, and comfortable quarters may be had at the Red Lion. Population, 749; market-day, Monday. 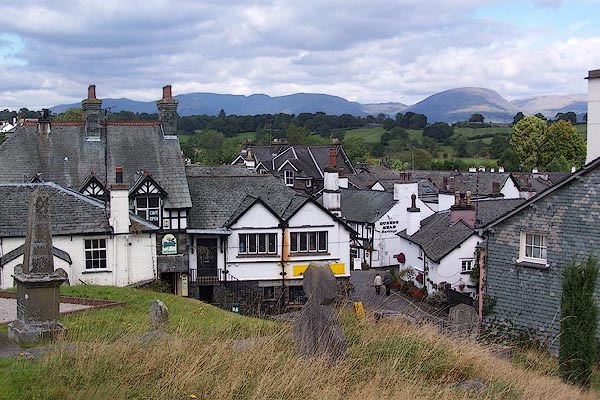 We will next return to Hawkshead, a little market-town about four miles from Ambleside, pleasantly situated at the foot of a range of small mountains, covered chiefly with wood. On the south side of the valley, in the middle of which is a Lake called Estthwaite-water, ... At Hawkshead is a grammar-school ... it also makes this place much resorted to by the families who visit their children here in Summer; its market is weekly, on Mondays. blocks on a street plan, labelled in block caps; settlement, market town? Church, symbol for a parish or village, with a parish church. Print, etching? The Hawkshead Morning Walk, Lancashire, by Harry Goodwin, published by Swan Sonnenschein and Co, Paternoster Square, London, 1890. Tipped in opposite p.40 of Through the Wordsworth Country, by William Knight. Drawing, At Hawkeshead, Lancashire, by John Harper, 1840. View of Lakeland vernacular buildings in Hawkeshead featuring group of domestic buildings. Executed in pencil with touches of white gouache on buff coloured paper. Preparatory sketch drawn on the spot by the artist. Atkinson, John, hoop manufacturer, Outgate. Atkinson, Richard B., beerhouse keeper, Outgate. Backhouse, Richard, farmer, High Wray. Baisbrown, John, gardener and seedeman. Barker, John, painter & glazier. Bell, Dorothy, tea dealer, Green End. Benson, Thomas, farmer, Field Head. Black, James I., officer of excise, Hannakin. Bowman, Thomas, Esq., (J.P.) Rogerground. Bownass, William, calf dealer, Thompson Ground. Braithwaite, George, boot and shoe maker. Brockbank, Robert & Matthew, joiners, Hannakin. Burton, John, tailor and draper. Coward, Edward, farmer, Keen Ground. Coward, William, miller, Hawkshead Mill. Coward, Wiliamn, flag merchant, Outgate. Crawford, Rev. Samuel, Borwick Lodge. Croasdale, John, farmer, Skinner How. Croasdale, Isabella, farmer, Sawrey Ground. Dixon, James, waller, Croft Head. Dugdale, John, farmer, Tock How. Forrest, W. farmer, Beyont Field. Forsyth, John, wood monger, Field Head. Fothergill, John, farmer, Esthwaite Hall. Garnett George, farmer, Sunny Brow. Gill, Sarah, King's Arms Inn. Hartley, William, bacon dealer and farmer, Tock How. Hawkrigg, J. yeoman, Town End. Hewitson, Miles, boot and shoe maker. Hickie, Daniel Banfield, L.L.D., master of grammar school. Hodgson, Braithwaite, Esq., Green End. Hopkins, Joseph, Esq., Belle Grange. Hutchinson, John, boot and shoe maker. Jefferson, William, farmer, Borwick Lodge. Kendall, Wm., yeoman, Hawkshead Field. Kendall, James, yeoman, Hawkshead Field. Kirkby, Mat., farmer, Waterson Ground. Ladyman, George, Queen's Head Inn. Leviston, George S., yeoman, Greystone Cottage. Lodge, Edmund, Esq., Keen Ground. Medcalf, William, Esq., Mill Hill Cottage. Miligan, Michael, farmer, Knipe Fold. Nicholson, George, tailor and draper. Noble, Robert, boot and shoe maker. Noble, John, ironmonger and grocer. Park, Rev. George, Parsonage, Walker Ground. Parker, Anthony, farmer, Hawkshead Hall. Poole, John, Esq., solicitor, Field Head House. Satterthwaite, Jonathan, bacon curer, Colthouse. Studdart, Robert, boot and shoe maker. Swainson, G., farmer, Sike Side. Taylor, Ferdinando, Red Lion Inn. Taylor, Joseph, beerhouse keeper, Waterbarnets. Usher, John, Brown Cow Inn. Usher, John, waller, Sand Ground. Walker, William, bobbin manufacturer, Bobbin Mill Cottage. Walker, John Thomas, bobbin turner, Summer Hill. Wardley, Joshua, farmer, High House. Wardley, Thomas, farmer, High Barn. Wilson, Mary, national school mistress. Wilcock, Thomas, Esq., Lake Bank. Wilson, William, Esq., land agent, High Wray. Wild Lakeland, by MacKenzie MacBride illustrated by Alfred Heaton Cooper, published by Adam and Charles Black, London, 1922-28. Print, colour, Hawkshead, by Alfred Heaton Cooper, published by Adam and Charles Black, 4-6 Soho Square, London, 2nd edn 1928. Tipped in opposite p.81 in Wild Lakeland by MacKenzie MacBride. Print, lithograph? Anne Tyson's Cottage, Hawkshead, from a watercolour by Arthur Tucker, published by Chatto and Windus, London, 1911. Tipped in opposite p.140 of Wordsworthshire by Eric Robertson. Print, lithograph? Flag Street, Hawkshead, from a watercolour by Arthur Tucker, published by Chatto and Windus, London, 1911. Tipped in opposite p.134 of Wordsworthshire by Eric Robertson. Print, lithograph? Cottages, High Hawkshead, from a watercolour by Arthur Tucker, published by Chatto and Windus, London, 1911. Tipped in opposite p.110 of Wordsworthshire by Eric Robertson. Print, lithograph? Mrs Hodgson's Cottage, Hawkshead, from a watercolour by Arthur Tucker, published by Chatto and Windus, London, 1911. Tipped in opposite p.102 of Wordsworthshire by Eric Robertson. Print, lithograph? Hawkshead, from a watercolour by Arthur Tucker, published by Chatto and Windus, London, 1911. Tipped in opposite p.64 of Wordsworthshire by Eric Robertson. Print, halftone photograph, A Street in Hawkshead, Lancashire, published by C Arthur Pearson, Henrietta Street, London, 1900s. On p.91 of Pearson's Gossipy Guide to the English Lakes and Neighbouring Districts. A STREET IN HAWKSHEAD. (p.90). Print, halftone photograph, Old House, Hawkshead, Lancashire, published by C Arthur Pearson, Henrietta Street, London, 1900s. On p.10 of Pearson's Gossipy Guide to the English Lakes and Neighbouring Districts. Book, Sketch of Furness and Cartmel, by Charles M Jopling, published by Whittaker and Co, Ave Maria Lane, London and by Stephen Soulby, Ulverston, Cumberland, 1843. Print, Hawkshead, Lancashire, by Charles M Jopling, published by Whittaker and Co, Ave Maria Lane, London and by Stephen Soulby, Ulverston, Cumberland, 1843. Book, Lakeland and Ribblesdale, OR A Thousand Miles of Wandering along the Roman Wall, the Old Border Region, Lakeland, and Ribblesdale, by Edmund Bogg, publishd by Edmund Bogg, 3 Woodhouse Lane, and James Miles, Guildford Street, Leeds, Yorkshire, 1898. Photograph, halftone print, Flag Street, Hawkshead, Lancashire, published by Edmund Bogg, 3 Woodhouse Lane, and James Miles, Guildford Street, Leeds, Yorkshire, 1898. Included on p.217 of Lakeland and Ribblesdale, by Edmund Bogg. Print, engraving, Dame Tyson's Cottage, Hakwshead, Lancashre, by A Haselgrave, 1897, published by Edmund Bogg, 3 Woodhouse Lane, and James Miles, Guildford Street, Leeds, Yorkshire, 1898. Included on p.216 of Lakeland and Ribblesdale, by Edmund Bogg. Print, uncoloured engraving, Hawkshead, Lancashire, published 1870. On p.69 of Furness, Past and Present. hearsay In the Act against vermin, 1566, Parliament decided that each parish should be responsible for exterminating the fox. The bounty on a fox's head was one shilling; about the 17th century, Hawkshead was paying five shillings. hearsay In Hawkshead, wiggs are tea cakes. Samuel Pepys took his wiggs with ale. ... and shortly after that fell downe upon the floore; and was straightway carried to his bed where hee layed two and twenty hours; dureinge which time hee could never speke, noe, nor never did know any body though many Came to See him and Soe he dyed.